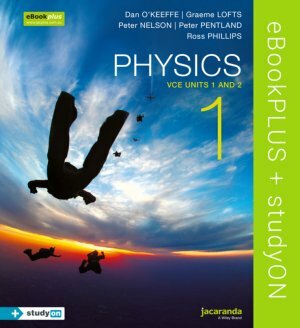 Physics 1 VCE Units 1 and 2 eBookPLUS (Online Purchase) with studyON Physics Units 1 and 2 (Online Purchase) provides comprehensive coverage of the new VCE Study Design for 2016-2021. It includes Jacaranda’s unique exam preparation tool, studyON, which has been fully integrated with the text to maximise every student’s opportunity for exam success. • New HTML5 interactivities and videos are available. These are designed to engage, excite and enhance understanding by bringing difficult concepts to life. • Sample problems throughout the chapter to improve student understanding by stepping through worked solutions. • Revision questions throughout the chapter check and challenge students understanding. • A wide range of graded end-of-chapter questions and chapter reviews. • All twelve Options chapters available in HTML online in the eBookPLUS. • studyON VCE Physics Units 1 and 2 is fully integrated with the student text. studyON is Jacaranda’s unique study, revision and exam preparation tool. This resource is a comprehensive digital-only product that includes studyON VCE Physics Units 1 and 2. How hot is the Earth? How rapidly do electrons travel through a conductor? What happens in an electric circuit? What makes the nucleus change? Friction  what a drag! Chapter 14: What are stars? Chapter 15: Is there life beyond our solar system? Chapter 16: How do forces act on the human body? Chapter 17: How can AC electricity charge a DC device? Chapter 18: How do heavy things fly? Chapter 19: Are fission and fusion viable nuclear energy power sources? Chapter 20: How is radiation used to maintain human health? Chapter 21: How do particle accelerators and colliders work? Chapter 22: How can human vision be enhanced? Chapter 23: How do instruments make music? Chapter 24: How can performance in ball games be improved? Chapter 25: How does the human body use electricity?